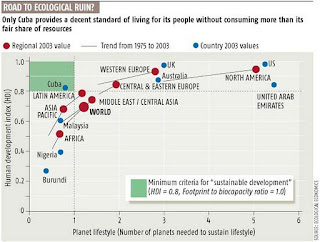 Our current way of life is not sustainable. We know this. What we don't know - or perhaps more accurately - what we can't agree on - is what should be the shape of the future we should be working for. I'm not a utopian but I think that without a vision of an alternative future that we want to fight for, it will be difficult to determine whether we are getting closer to it or closer to the looming Dark Mountain. The only sustainable country in the world is Cuba. For human rights and geopolitical reasons, we can't hold Cuba as a model to us to emulate and follow. That's why Costa Rica is generally held up as a viable vision instead. But I think that the average Canadian is still going to have a hard time understanding what a more 'Costa Rican' future would look like. At best, I think Canadians associate Costa Rica with ecotourism - and that's about it. I think there is another model future that Canadians can understand and it's one that will not only emulate - it's one that they can emulate with enthusiasm. I know this because many Canadians already do this two weeks a year. It became clear to me a couple years ago. Friends of ours had won a charity auction for a time-share of a large cottage in Northern Michigan and they invited my family and another to spend time with them for a better part of a week. It was an ideal cottage experience. Surrounded by trees and bird-song. Visits to beaches and nature reserves. Board and card games. Reading and radio. Conversation. Trips to farmer's markets and roadside stands. Communal meals. Beer with lunch. Wine with dinner. Friends and family. Let me be clear that I don't think that actual cottage life is sustainable. Evidence overwhelming backs up the once controversial statement that "the city is the most environmentally benign form of human settlement." But the cottage lifestyle is worth pursing - as is the cottage aesthetic. At the cottage, ordinary people have no problem buying biodegradable soap and taking care so as not to upset the capacity of the septic tank. Second-hand unmatched furniture is the norm. Family photographs and local crafts line the wall. Bookshelves of books that are worn from sharing. Houses have names. Places have history. Urban cottage living would be an understandably Canadian response to our global problems. So please join with me in my new battle cry: "In the cul de sac, a lake!"